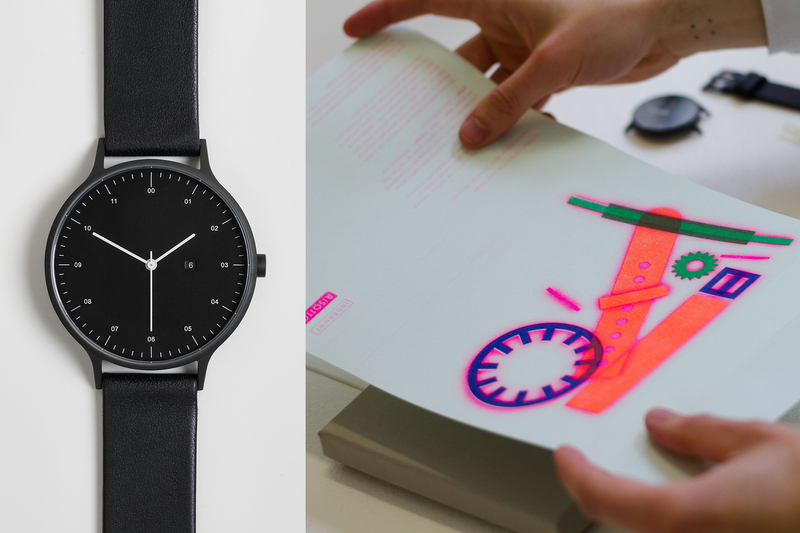 Instrmnt, a design studio founded by Pete Sunderland and Ross Baynham, present a special edition of their minimalist watch presented in bespoke risograph packaging. Inspired by the way our belongings are often reassembled while in transit, Instrmnt collaborated with RISOTTO studio to imagine the contents of their Instrmnt 01-D through the eyes of the airport x-ray machine. Instrmnt 01-D x RISOTTO features pared-down design with brushed black casing, black face, and high quality black leather strap. In direct contrast with the monochrome watch within, the colourful riso print corresponds to the materials an x-ray machine picks up and how they are shown: blue – metal, orange – biological, and green – plastics & alloys. The illustrated packaging was produced and printed in Glasgow by RISOTTO while the watch was created by Instrmnt – two studios that have distinct, discordant styles. The graphics featured on the packaging are playful, anarchic, stylised forms; a sharp contrast to the regimented and minimal interior of the box, and the subdued colour scheme of the watch.